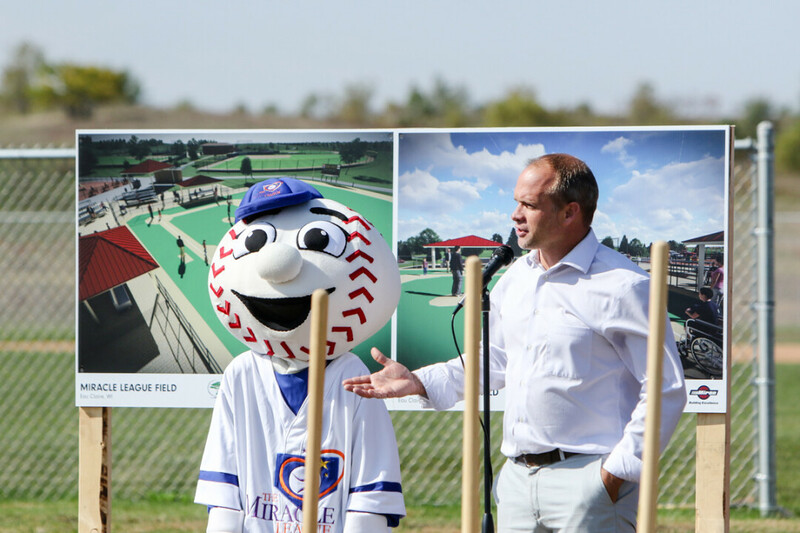 The cry of “Let’s play ball!” will be heard at the newly developed baseball and softball fields at Jeffers Road Park next spring. However, come June 3, those words will be directed for the first time at the players in the Miracle League of the Chippewa Valley, one of three such leagues in the state supported by Goodwill Industries. Miracle Leagues offer inclusion to kids who are otherwise sidelined from participating in recreational sports due to disabilities. 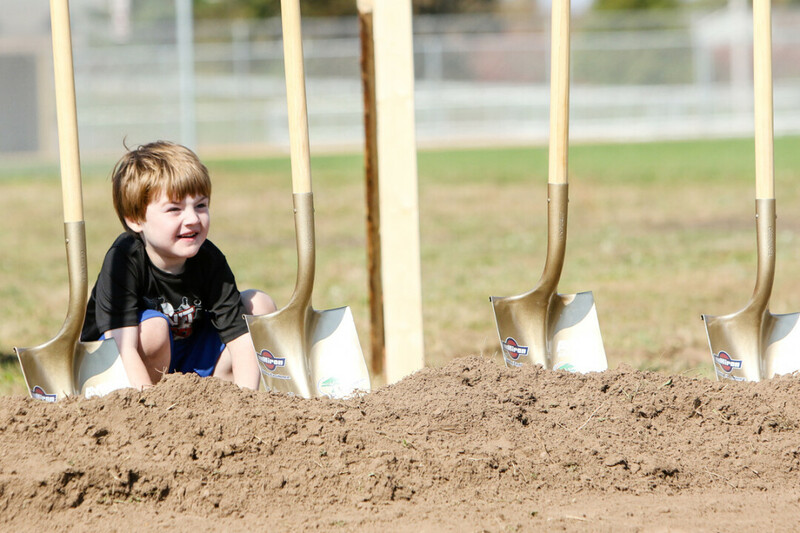 The new field will provide children like Sawyer Standiford, who was born with Down syndrome, a chance to find inclusion instead of exclusion. The Miracle League is the “equivalent to opportunity” for Sawyer, explained his mother, Amy, at an Oct. 4 groundbreaking for the new field. She explained the Miracle League and the field offer a chance “to play ball, to be a part of a team, to make new friends.” For families like the Standifords, the creation of baseball teams will help make the Chippewa Valley a more inclusive place to grow up. The benefits of such a league and field are plentiful for a growing community. Nancy Heykes, who is helping raise funds for the Miracle League, described the leagues and the players as being unable to contain the excitement surrounding a game day. Many parents experience this excitement, she says, when their sons or daughters are ”sleeping in their uniforms the night before a game.” That excitement carries to other facets of the community as well. Community relationships are built around these fields as a way to provide a supportive atmosphere for families with disabilities. The fields are places where families can let down their guard in a safe atmosphere as well as places where community members can become better acquainted with these families. “These leagues help people get over awkwardness, to help people look beyond the special need and to get to truly know the kids,” Heykes said. The field, specifically designed for children with disabilities ranging from 4 to 19 years of age, will be rubberized to allow everyone the opportunity to run the bases regardless of how they get around.The game itself will be played much like a traditional ball game, which will create the fun and energetic atmosphere that typically surrounds youth sports. Every game has two innings, allowing every player to bat and run the bases. As at most youth sporting events, the national anthem will be sung before every game, the players will be announced on the field, and a rousing rendition of “Take Me Out to the Ball Game” will be sung during the traditional seventh inning stretch (or in this case, in between the first and last innings). In addition, each player will be assigned a buddy who will assist him or her on the field during the two-month season. 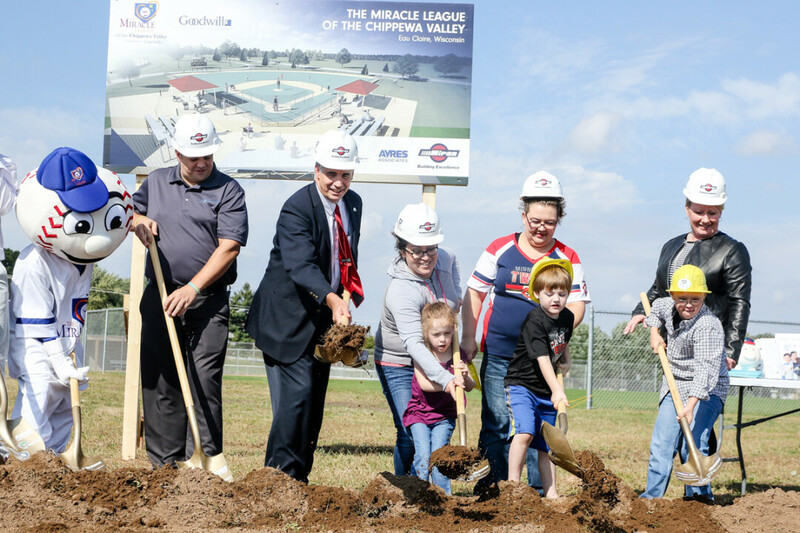 The plans for the Miracle League field, funded in part by a $100,000 donation from Goodwill Industries of Northwest Wisconsin, local construction companies and businesses and supported by various city leaders, also include bleachers, a scoreboard, handicap-accessible dugouts, a handicap-accessible bathroom, and additional handicap parking spaces for easy access to the field for the players. However, Heykes notes that the funding for the field is a work in progress. Donations are still being sought in order for the field to reach its $525,000 goal and volunteers are still needed to help run the league and maintain the field. To learn more about how to donate time or money, please go to chippewavalleymiracleleague.com or visit “The Miracle League of the Chippewa Valley” on Facebook.